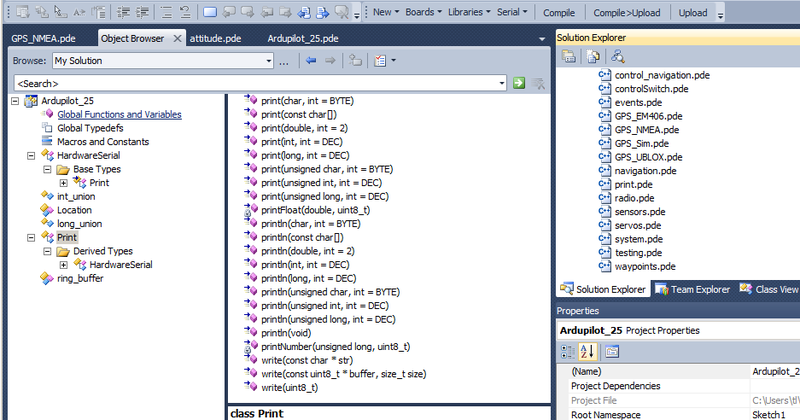 Editing any of the ardupilot versions using visual studio 2010 really shows off the quality of the ardupilot code. I love people who comment their code. Very neat! And look how easy arduino project "navigation" is in Visual Studio, you can "Go To" the right place in the code. I didn't know where the stabilize() function was but visual studio "Go To Definition" took me right to the attitude.pde. The intellisense in visual studio works best with well stuctured programs such as ArduPilot! You need Visual Micro to make this work easily in 2010. It is free and quite new so the help system is a little confusing. Feel free to grab a copy.